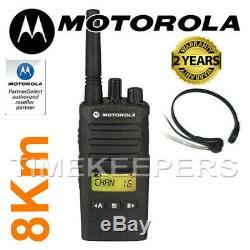 8Km Motorola XT460 Walkie Talkie 2 Two Way IP55 PMR 446 Business Military Radio. MOTOROLA XT460 MILITARY SPECIFICATION & BUSINESS TWO WAY RADIO IP55 - 8km 1 FREE THROAT MIC HEADSET WITH VOX/PTT. The XT460 on-site two-way business radio helps you communicate instantly, without missing a beat. With crisp, clear audio throughout the workplace and exceptional durability, the XT460 delivers great performance even with hard use in high noise, harsh conditions. The XT460 radio operates without subscription or call charges on PMR446 unlicensed frequencies, offering 8 channels and 219 user selectable privacy codes to help ensure a clear signal. An easy to read display and four programmable buttons enables quick access to features. Enhanced audio quality, a rugged design, and versatile HTML-based customer programming software, make this radio an exceptional choice for all your on-site business needs. Range up to 8Km - Depend on terrain and conditions. 16 pre set channels for ease of use. 219 Interference Eliminator codes - reduces interference from consumer radios. Cloning (via charger or MUC). Time out timer (can be disabled). Alerts: Channel Busy/Heartbeat/ Transmit LED Low battery alert. 1 X Rechargeable LiIon Battery. 1x AC chargers with UK & Euro Adapters. 1X Drop in Carry Case with Belt Clip. Frequency Range (MHz): 446.00625 - 446.09375. Talk Range: Up to 8km (4.5 miles) depend on terrain and conditions. Dimensions : 118 (H) x 55 (W) x (34) D mm. Weight: 165g with NiMH Battery/171g with AAA Batteries. Power Supply: 4 Premium AAA Alkaline Batteries..................... Battery Life: 14 hours usage per charge (NiMH) 20 hours usage (AAA). Intended for use in the following countries: Austria, Belgium, Bulgaria, Croatia, Cyprus, Czech, Denmark, Estonia, Finland, France, Germany, Greece, Hungary, Iceland, Ireland, Italy, Latvia, Liechtenstein, Luxembourg, Netherlands, Norway, Poland, Portugal, Romania, Slovenia, Spain, Switzerland, Turkey, UK. Our mission is simple: to deliver quality, branded products at affordable prices. As such, we offer a full range of branded goods specialising in retail and wholesale. Our commitment to serve you with a better online shopping experience shows in our wide range of consumer goods. Our inventory is continuously updated with new brand lines and models. We always put our customers first. No matter how large or small the order we aim to give you a first class service. Manufacturers prices direct to the public on most products. Large collection of brand name products. This guarantee excludes pierced earrings for hygiene reasons. In the unlikely event of your item arriving damaged or faulty, please ensure that you notify us within 7 days of receipt and we will provide a replacement. Failure to notify us within this time period will invalidate the return request. All helicopters must be checked for full function before being flown. Ground test instructions, advice and tips are included with each item. If your item is faulty upon arrival, it must be reported to us within 7 days of receipt, after ground test and before take off, no exceptions. No helicopter is indestructible whether real US military bullet proof Apache, remote controlled electric-, turbine-, gasoline-powered, or large, midi or micro. Most spare parts are available to order. We cannot guarantee availability of parts. Should your helicopter develop a fault after the first 7 days, we will repair/replace your helicopter in accordance with your statutory rights, provided such damage has not been caused by misuse or negligence on the part of the user. Please be sure to inspect your watch as soon as you receive it. Before wearing or removing any tags or factory tape, check over the watch to see that it is in perfect working order, with no blemishes. All our watches are 100% brand new and should keep accurate time. It is the customer's responsibility to inspect the watch upon receipt to ensure that it is in perfect working order, before wearing. All Oskar Emil watches come with clear cellophane wrapping and may be worn and tried without removing the wrapping. Please do not remove the wrapping or resize the strap if you intend to return the item. Be the First to Know. Get all the latest information on Events Sales and Offers. Sign up for newsletter today. The item "8Km Motorola XT460 Walkie Talkie 2 Two Way IP55 PMR 446 Business Military Radio" is in sale since Saturday, November 24, 2018. This item is in the category "Mobile Phones & Communication\Radio Communication Equipment\Walkie Talkies & PMR446 Radios". The seller is "timekeepersint" and is located in LONDON. This item can be shipped worldwide.